This edition of MRM’s News Bites features General Mills Foodservice, Toast, Fourth, Gordon Food Service and Square Roots, Monkey Group and Field Day, Paytronix and Zenreach, Serve and ItsaCheckmate, 360Training and Qwick, BevSpot, Textio and McDonald's, DoorDash and PlantPure Communities. Marking its fifth year, the Neighborhood to Nation™ Recipe Contest from General Mills Foodservice is bigger than ever—doubling the number of winners to give even more independent restaurants and food trucks the chance to win more than $200,000 in cash and prizes. The restaurant recipe contest is officially accepting entries for original recipes that use at least one item from General Mills’ list of eligible products as a recipe ingredient. The Neighborhood to Nation Recipe Contest is open to foodservice operators, chefs and line cooks who develop and prepare recipes for menu items served at independent, commercial restaurants or food trucks. From March 1 to April 30, 2019, participants may log on to www.neighborhoodtonation.com to submit an original recipe using at least one ingredient from General Mills Foodservice’s participating brands: Pillsbury™(biscuits, puff pastry and pie dough), Gold Medal™(baking mixes), Yoplait®(yogurt) and Mountain High®(yogurt). Toast released a suite of new features focused on the guest experience: Toast Guest Feedback, the first multi-channel guest feedback platform built exclusively for restaurants. Toast Guest Feedback empowers restaurant owners to collect and act on guest reviews in real-time via Toast Digital Receipts and Toast Go™. With Toast Guest Feedback, restaurateurs can collect positive or negative reviews from dine-in guests when checking out with Toast Go; they are also able to collect feedback from diners ordering food to-go through Toast Digital Receipts. Restaurant managers can elect to receive an SMS notification every time a guest leaves a negative review. Real-time feedback empowers restaurant operators to show their commitment to the guest experience by immediately addressing negative reviews. Timely responses to negative ratings are more important than ever – a Toast study found that 65 percent of one-star Yelp reviews were posted within one day of a poor dining experience. The Toast Guest Feedback report summarizes all reviews, providing restaurants with invaluable information that they can use to coach their staff, adjust their menu, and improve the guest experience. The Toast Kiosk start screen is now customizable to incorporate brand colors and images. Restaurateurs can also highlight add-on items to incentivize guests to bolster their orders, or choose to hide menu items that they do not want to offer on a Toast Kiosk. Fourth launched its full-service HR, benefits and payroll services in the U.S. market. In addition to its complete hospitality operations platform with sales forecasting, scheduling, purchase-to-pay and inventory capabilities, Fourth now offers full-service payroll, benefits and HRO services, following its recent acquisition of Choice HR. By combining the power of its advanced hospitality management technology with deep HR expertise, Fourth enables operators to simplify their processes, optimize profits and improve employee engagement all while managing complex HR and payroll compliance. According to the latest data from the Bureau of Labor Statistics, the turnover rate in the restaurant industry holds firm at around 70 percent. In addition to workforce management challenges and day-to-day operations, restaurant operators are also spending countless hours navigating increasingly complex HR and compliance issues. Traditionally, operators have relied heavily on multiple technology platforms, or worse, paper and spreadsheets, to manage these tasks, resulting in unmanageable amounts of siloed data. Fourth’s hospitality operations platform breaks open these data siloes, providing complete visibility across the entire business in real time. Additionally, by providing unmatched access to full-service, hospitality-specific payroll, benefits and HR services, Fourth enables operators to focus on improving business outcomes rather than onerous HR matters. All-Inclusive Hospitality Operations Platform: The Fourth platform seamlessly integrates with every major POS system, finance platform and many industry specific third-party applications. With one user name and password, operators can quickly access a wealth of reports and dashboards. Full-Service Payroll, Benefits and HR Services: Eliminating the need for multiple systems, Fourth brings advanced hospitality operations management technology as well as full-service payroll, benefits, workers compensation and HR services together, providing managers the freedom to focus on improving business outcomes rather than tedious HR matters. Advanced Demand Forecasting: Rather than simply cataloging historical data, Fourth’s complete platform provides unrivaled advanced demand forecasting – using predictive algorithms and machine learning to factor in historical trends, weather and local events. By calculating a daily baseline forecast at 15-minute intervals by sales item, Fourth’s demand forecasting capabilities enable customers to ensure they have the labor and the inventory to deliver a great guest experience – every time. Analytics and Reporting Dashboard: Fourth’s intuitive platform features interactive graphs and charts that are automatically populated based on the unique KPIs of the business. With all the information an operator needs stored on the Fourth platform, CEOs, CFOs and managers can easily turn data into actionable insight at a click, leading to better business decisions. Fourth continues to expand its footprint in the U.S., currently recruiting an additional 25 employees to its 70-person team in New York and Florida. Gordon Food Service®​ and Square Roots formed a strategic partnership will ultimately see new campuses of Square Roots’ indoor farms built on or near Gordon Food Service distribution centers and retail stores across the continent, enabling year-round growing of premium quality herbs, greens, and more, and made available to Gordon Food Service customers. This partnership reflects a shared vision and commitment by both organizations to invest in a modern, unique offering to meet growing customer demand for local food across North America. It also signifies the first, significant expansion to new locations for Square Roots and its unparalleled farmer training program, enabled by the company’s scalable “farmer first” technology platform. The Square Roots and Gordon Food Service exclusive partnership comes at a time when customer tastes and palates are seeing an increasing demand for fresh, high-quality, local food. “Customers want an assortment of fresh, locally grown food all year round. We are on a path to do that at scale with Square Roots and are excited to be the first in the industry to offer this unique solution to our customers,” said Rich Wolowski, CEO of Gordon Food Service. Square Roots’ mission is to bring local, real food to people in cities by empowering the next generation of leaders in urban agriculture. The company combines a high-tech farming platform with a unique “Next-Gen Farmer Training Program” to train passionate people to become future leaders in the food industry. Meanwhile, Square Roots’ Transparency Timeline enables customers to trace exactly how and where their food was grown and who grew it, simply by scanning a QR code on its packaging. Now, having partnered with Gordon Food Service, this unique ability to bring technology-enabled local food will soon become a reality for food-conscious consumers across North America. And the Next-Gen Farmer Training Program will soon open up doors for even more driven young people, arming them with the skills to take part in building a better food system for our future. Monkey Group and Field Day formed a strategic partnership to help multi-unit brands staff last-mile marketing opportunities, deploying brand ambassadors to conduct community marketing and sales outreach specifically focused on each restaurant operators’ catering business. Field Day works with large restaurant brands to understand their sales and marketing challenges and goals, and then aligns each objective with the solutions Field Day offers. Brand ambassadors employed by Field Day are tasked with driving brand awareness and excitement to targeted local businesses, so a navigational map is algorithmically developed highlighting which type of businesses to target within each assigned trade area. What gets reported back to the restaurant team is a list of sales leads, the map area covered, duration of field work, photos of the overall experience, and the number of sales collaterals distributed throughout the market. Every canvassing moment is tracked and documented within the Field Day platform along with pictures verifying the time spent. Paytronix Systems, Inc., is collaborating with Zenreach, creator of the Walk-Through Ratetm that connects online marketing with in-store results, to help their mutual client, Anthony’s Coal Fired Pizza, gain a deeper understanding of more of its guests in order to offer them more targeted and highly personalized experiences. As Anthony’s Coal Fired Pizza expanded the number of its locations, the restaurant chain was looking for ways to maintain a high level of guest engagement in keeping with its “everybody-is-family” approach to customer service. To do this, Anthony’s leveraged Zenreach for its WiFi marketing platform to collect guest information during the WiFi login process and leveraged Paytronix’s Rewards Platform to understand customer preferences and drive loyalty. Serve announced its official partnership with ItsaCheckmate. Joining ItsaCheckmate’s list of partners that facilitate food sales and delivery in the growing on-demand restaurant business, Serve increases its reach and furthers its goal of becoming a global engine for e-commerce. Renowned for its innovative software currently utilized by established delivery companies, Serve is at the forefront, making last-mile delivery logistics a viable option for every business, from global businesses to small mom-and-pop restaurants. Offering solutions for the transportation, logistics and retail industries, with countless more applications to come, Serve provides accountability at every stage, helping end users including enterprises and providers increase efficiency and reduce costs by removing unnecessary middlemen from transactions. “As restaurants streamline their operations to take advantage of rapidly increasing online orders, we expect hundreds of thousands of restaurants to benefit from ItsaCheckmate’s unique solution," adds Tiger Global Management Partner Scott Shleifer. 360training.com and Qwick joined forces to make it easier than ever for hospitality professionals to earn extra money in their downtime. As a result of this new partnership, hospitality professionals using the Qwick platform will now have access to 360training.com’s catalog of accredited food and beverage courses so they can earn or renew required certifications and pick up open shifts all in one place. “Qwick is excited to partner with 360training.com to provide the professionals on our platform with an easy way to obtain up-to-date certifications, making them fully compliant in their respective roles,” says Blaine Light, Co-Founder and Chief Operating Officer of Qwick. Qwick’s platform not only addresses the issue of understaffing within the food and beverage industry, but it also provides servers, bartenders, dishwashers, and cooks in Phoenix, San Diego, and other markets coming soon with flexible opportunities to work when they want to. 360training.com will be the sole training and certification provider for Qwick’s users looking to pick up shifts in the hospitality industry in real time. BevSpot launched its new automated invoice management, advanced recipe building, and batching features. The new features expand BevSpot’s offering by giving restaurant operators greater control of their end-to-end operational processes and fill key gaps between their currently established systems—specifically their Point of Sale (POS), and Accounting systems. In addition, the features are universally applicable to every F&B operation in the world and will simplify the user experience for all current and future customers. BevSpot is an all-in-one food and beverage management software company that provides a simple but powerful solution for managing day-to-day operations including inventory, ordering and invoicing, recipe costing, and sales and loss tracking on any internet connected device anywhere in the world. The food and beverage industry still rely heavily on spreadsheets and clipboards. BevSpot helps industry professionals easily transition from these spreadsheets and clipboards to cloud-based software. By digitizing their inventory, invoice, recipe, and sales data, BevSpot helps users gain valuable insights to improve their bottom line. According to Crawford, in an industry where the average restaurant runs on six percent profit margins and 59 percent of restaurants fail in their first three years, BevSpot customers are 10x less likely to fail and 30 percent go on to open up new locations each year. It’s a staggering metric that highlights both the value of data in running a successful restaurant as well as the success of operators that recognize the opportunity to adopt cloud-based solutions to improve existing operations. Textio, the developer of the world's first augmented writing platform announced a new partnership with the McDonald's Corporation. Together with its Franchisees, McDonald's receives upwards of 20 million applicants a year to support hiring nearly two million people, making them one of the most significant employers in the world. As McDonald's is planning for their next stage of growth, they are investing in world class technologies that improve their hiring and recruiting processes at scale. Textio, a 2019 Finalist for the SxSW Innovation Awards, has been brought on board to enable McDonald's to not only recruit and hire faster, but also to ensure they reach top-quality applicants in an inclusive manner. As McDonald's continues to modernize their technology across the enterprise, from self-order kiosks to adopting newer recruiting technology, McDonald's saw an opportunity to partner with Textio to bring the vibrant culture and brand voice of McDonald's into the recruiting process. "At McDonald's, our goal is to create feel good moments that ensure everyone feels welcome and included. That starts with the language we use when we reach out to you as a candidate," said Joshua Secrest, Sr. Director of Global Talent Attraction. "Textio's innovative augmented writing platform will give us the insights to know, in real time, whether the language we are using is attracting the most qualified and diverse candidates we can." Textio is fueled by a massive data set of real-world hiring outcomes from hundreds of millions of job listings across industries and around the globe. Every month, this data set grows by 10 million new documents, with the latest hiring results attached to each one. The work with McDonald's will further develop the platform's capabilities in the hospitality and franchise industry. "Partnering with one of the world's most iconic brands is such a treat (pun intended). I'm excited to see McDonald's embrace augmented writing and modernize their recruiting process," said Kieran Snyder, co-founder and CEO, Textio. "This partnership will change the experience of millions of people applying to McDonald's every year and allow McDonald's to showcase its unique culture in the language that they use." In addition to making it easier for hiring managers and recruiters to write collaboratively in McDonald's brand language, Textio Hire will allow McDonald's to write gender neutral job posts, aligning with the company's goals to combat gender bias in the workplace. "We're excited to see the language patterns Textio uncovers to help our teams continuously learn and grow in the moment," said Secrest. "Textio takes the sometimes painful process of writing a job post or a recruiting email and makes it fun and engaging." 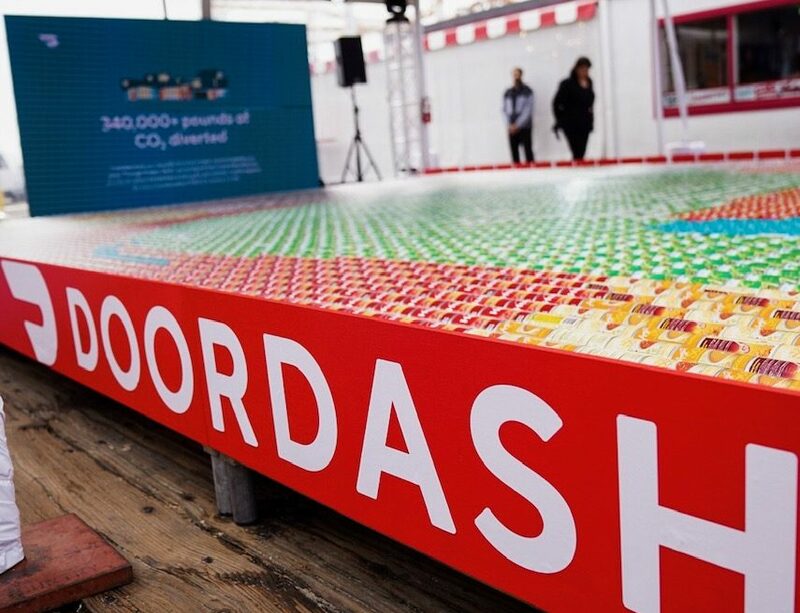 DoorDash officially broke a Guinness World Record for the largest-ever mosaic made of cans at the Santa Monica Pier to celebrate the success of its flagship Project DASH social impact program. On Friday, March 1, DoorDash unveiled a must-see record-breaking mosaic at the Santa Monica Pier. 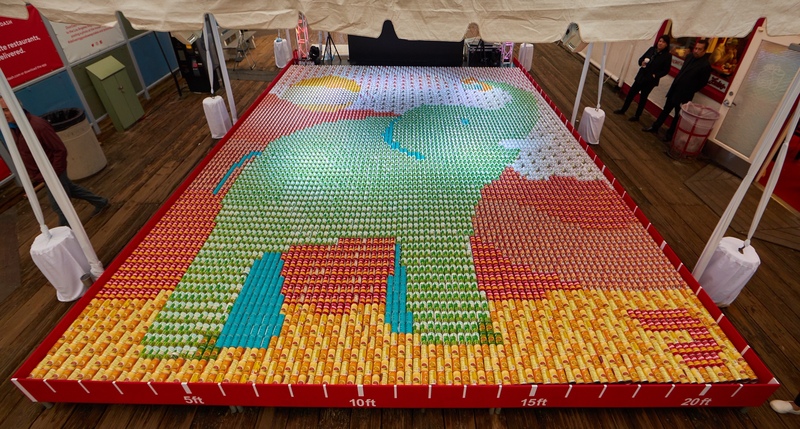 This visually stunning 22 x 25 ft installation in the design of an elephant included more than 6,000 cans. DoorDash’s founding mission is to deliver good by connecting people and possibility; with its flagship social impact program, Project DASH, DoorDash leverages its logistics expertise to tackle the dual epidemics of hunger and food waste. In its first year, Project DASH rescued more than 500,000 pounds of food, providing 429,000 meals to people facing hunger and diverting 279,000 pounds of CO2 from the atmosphere. This installation represents the sheer weight of food rescued and transported to hunger relief nonprofits by DoorDash’s Project DASH over the past year, which totals 625,000 pounds – the weight of approximately 48 African elephants. All of the cans used will be donated to the LA Regional Food Bank. The nonprofit organization, PlantPure Communities (PPC), report that two key milestones had been reached via the PPC Restaurant Campaign. With the addition of Snack Mafia – a restaurant located in Guwahati, India – there are now over 100 restaurants participating in the Campaign. Restaurants must offer at least one plant-based, oil-free meal on their menu in order to participate. The PPC Restaurant Campaign responds to the growing demand from health conscious diners seeking plant-based, oil-free menu options when dining out. Participating restaurants are discovering that nutrition-based healthy menu options help expand their customer base by attracting new diners seeking meatless, low fat menu options. The PPC Restaurant Campaign is being driven by the 200,000+ people connected to the PlantPure Communities Pod Network. To date, restaurants in eight countries – including, Australia, Bulgaria, Denmark, Israel, Canada, India, Italy and the US – have made this healthy menu item addition. Aparajita Barbora, manager at Snack Mafia (the 100th restaurant to join the Campaign), said: “I never thought business would increase so rapidly after joining the Campaign. We are adding more meat-free & dairy-free options to our menu as the number of people aware of the health benefits of a plant-based diet grows every day.” According to Foodable Labs, “51% of chefs in the U.S. are now offering vegan options.” Leland Neal, CEO of Taco Rico Franchising, a Tex-Mex restaurant chain in Florida with six participating restaurants, said, “We take pride in being able to offer many healthy vegan and vegetarian options. Doing this really sets us apart from any competition and allows us to grow sales in this exciting market.” Jeanne Minier, Assistant Manager at the Loving Hut Restaurant in Norcross, Georgia said, "We have new customers every day who have adopted the plant-based eating for life and are eager for oil-free and plant-pure choices. We encourage all restaurants to answer the call for more meat-free and oil-free options." As part of the Restaurant Campaign, Pod members venture out into their favorite restaurants to collaborate with chefs and restaurant managers to promote the addition of plant-based, oil-free options to their menus. The Campaign is supported by a virtual online toolkit which contains tips on how to approach a restaurant, how to adjust the menu, and how to ramp up business via social media and local press. Participating restaurants are spotlighted in PPC e-newsletters and social media platforms, are added to an interactive map on the PPC website, and PPC subscribers living within 50 miles of the restaurant are notified of the new healthy meal options, and encouraged to dine there with family and friends. “Everything we eat is either good or bad for our health — restaurants that add meat-free, oil-free meals make it possible to dine out with friends and family while supporting customers’ health goals,” said Jody Kass, PPC Executive Director. “The restaurant industry is changing – because American consumers are changing. More people are waking up every day to the realization that they can take control of their health and reverse their heart disease, diabetes and other chronic illness – just by changing what is on the end of their fork. While restaurant industry trends are always evolving, healthy plant-based dishes are here to stay!” said Nelson Campbell, PPC Board Chair and Founder. Beyond the health benefits of eating more plants, reducing the consumption of animal based foods also helps curb climate impact. An important report issued by the UN in October 2018 recommends that everyone reduce their consumption of animal products by 30% to avoid irreversible damage to the planet. There is growing momentum to push plant centric menus for public health and the health of the planet. To find out more about the PlantPure Communities Restaurant Campaign, visit this webpage and check out the Restaurant Campaign Toolkit and the interactive map listing participating restaurants.